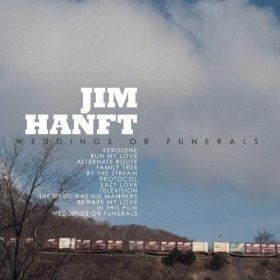 American singer-songwriter Jim Hanft traveled all the way to Sweden to record his debut album Weddings or Funerals. Hanft brought with him the dust of American highways and Swedish producer Lase Mårtén (Johnossi, Lykke Li, Peter Bjorn & John etc.) cleaned it right off. Although it wouldn’t have hurt to leave some traces, this is a rich album of easily digested folk pop songs. As the album title indicates, the lyrical territory spans a wide range of emotions albeit staying mindfully detached. On songs like title track “Weddings or Funerals” and “Beware My Love” Hanft’s ability to captivate is displayed. The latter stands out as the most intimate song, set in a somber musical landscape, accompanied by steel guitar and a lonesome double bass leading the way. The mood of the album is enhanced by the beautiful voice of Samantha Yonack. Yonack complements Hanft’s eager voice, creating a striking balance. This is evident on “Shipwreck,” a duet where Yonack adds a perfect touch of melancholy. With stories of life and love Weddings Or Funerals is an album with an old soul. Jim Hanft leaves you wanting to explore more than the surface, hopefully the next album will allow you to really get under his skin.